In this article, you’ll discover how to combine calls to action with Instagram features to capture more leads for your business. 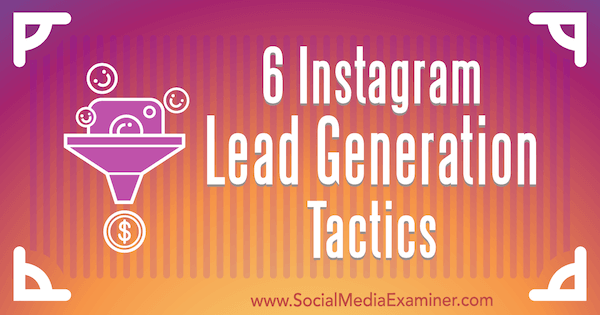 6 Instagram Lead Generation Tactics by Jenn Herman on Social Media Examiner. To best capture leads on Instagram, you’ll need to ensure that your profile is properly formatted and business-ready. 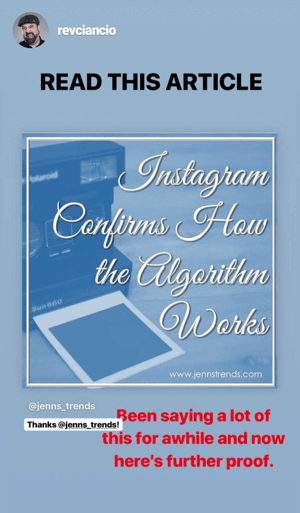 Your Instagram profile should have all of the major components complete. Upload a good profile image and compose a well-written bio that explains who you are, what you do, and why the visitor should care about your business. Additionally, the URL and action buttons should be properly formatted for easy use. 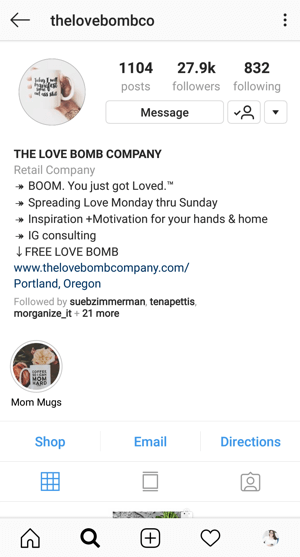 When @thelovebombco recently ran a campaign to get a free product, customers could easily get one in exchange for their information. To get the most out of your bio link, it’s best to create content in your feed that drives people to that link. 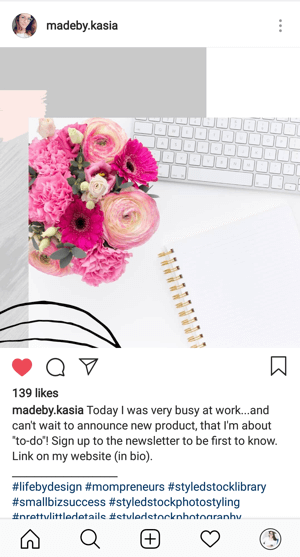 @madeby.kasia teased a new product and encouraged her audience to sign up for her newsletter to make sure they didn’t miss the announcement. This call to action is simple and effective because it appeals to her existing audience and drives traffic to her website while building her email list. There are plenty of creative ways you can use the link in your Instagram profile to collect leads, depending on how you use your website and lead capture technology. For example, if you use a pop-up to capture email addresses on your website, you can direct your bio link to send visitors to read a blog post or an information page. Instagram understands that businesses need effective means of connecting directly with their audience, and the platform has done a lot to improve that functionality with one-click action buttons on Instagram business profiles. You can have up to three action buttons on your profile. The default button options are Call, Text, Email, or Directions. Why? Because you can’t add someone to your email list simply because they emailed you. The act of emailing you doesn’t provide consent or an opt-in to your list itself. So while the Email button is definitely good to have, don’t rely on it for lead capture. A lot of businesses run offers that allow users to text a specific phrase to a five-digit number to either enter a contest or receive a link for a download, for instance. In doing this, the company is collecting the phone numbers of each entrant for remarketing purposes. 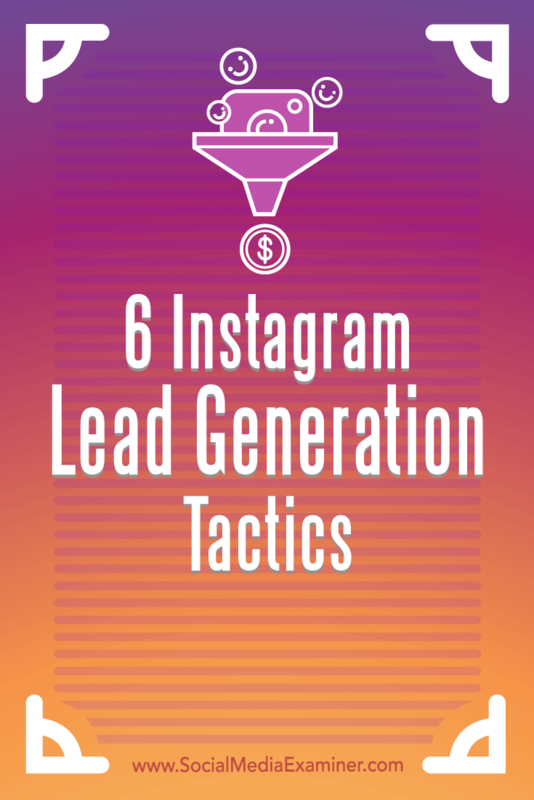 To run this type of lead generation on Instagram, you can use the Text action button to set up the text-to number for people to submit a keyword or phrase. To do this, edit your Instagram profile and select Contact Options. 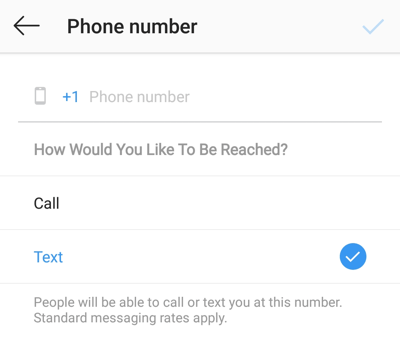 Then tap on Phone Number and select the Text option before entering your five-digit text code. You can also choose from additional action buttons tied to third-party tools like Resy, Eventbrite, or Grubhub. These integrated action buttons are designed to facilitate immediate actions like purchasing tickets, making a reservation, and so forth. If your company collects contact information from users as part of the transaction process within one of those third-party tools, however, it easily becomes a lead generating process in addition to an immediate transaction. In the same way you can use a CTA in a post to drive people to click on the link in your bio, good captions in your posts can help drive traffic to your action button. @cloakandpetal is a restaurant that frequently uses this tactic. One of the first things people think of for lead generation in Instagram Stories is using the swipe up link to drive viewers to a specific link they can click on. To illustrate, Amy Porterfield (@amyporterfield) uses the swipe up link to encourage viewers to sign up for a free training session. Pro Tip: If you regularly use swipe up links in your stories, save those story posts to your Instagram Highlights to create a gallery of content people can visit long after your initial story has been uploaded. This content will continue to drive opt-ins or sign-ups to your lead magnet. The swipe up link, however, is currently only available to business profiles with more than 10,000 followers. So it’s not applicable to everyone. But there are other ways you can get creative with your use of Instagram Stories! One of the best marketing features about IGTV is that your video descriptions can be lengthy and can include a clickable link regardless of your audience size! So anyone can add a clickable link to the video description. There are plenty of ways you can incorporate a lead magnet as your link in the IGTV description. You can include a link to a free PDF download that offers more information on the topic covered in your video. Or you could link to an opt-in page for a training video with more information about the topic of the IGTV video. Remember that IGTV is a channel people use to watch video, and they won’t necessarily open or read the whole description on their own. For best results with IGTV video description links, be sure to state during the video that viewers can get your download or additional information by clicking on the link in the video description. 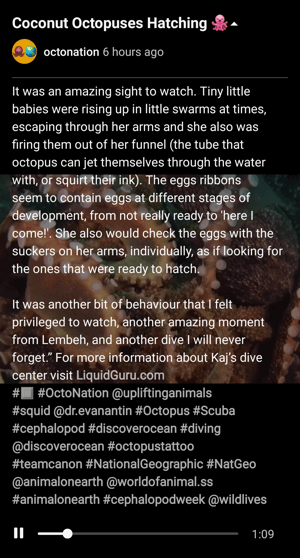 Design a post (or series of posts) for your Instagram stories that teases or discusses the topic of your IGTV video. 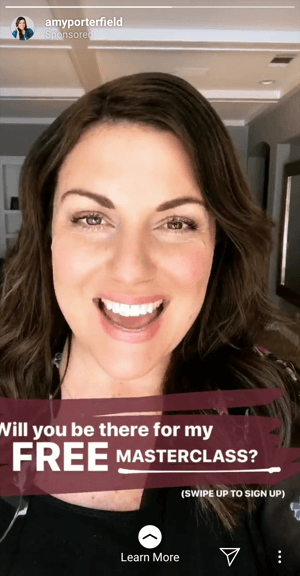 This tactic will drive people from your Instagram story to your IGTV channel and video, and ultimately to your lead page. This does require a few extra steps on both your part and the viewer’s part. But the quality of opt-ins you generate using this strategy will ensure they’re some of the most likely to convert once they’re in your funnel. Pro Tip: Instagram just recently released a new feature that allows you to create a teaser of your IGTV video that you can share directly to your Instagram story. This creates an immediate link back to your IGTV video so that image can be used in the same way to drive traffic to your IGTV channel. Instagram isn’t a platform marketers readily associate with lead generating tactics. Unlike Facebook, Twitter, LinkedIn, and others, Instagram doesn’t offer the ability to include links in posts, nor does it offer common lead generating tools. And, being a visual platform with truncated captions in the feed, most users aren’t looking for links or options to click on. Most marketers understand the value of lead generation. We appreciate the ability to get social media followers off of social platforms and into our own funnels. So, while other businesses may bypass the option to use Instagram for lead capture, with the tips here you can begin using your Instagram profile as another lead generating tool for your business. Instagram has a variety of creative ways to drive leads for your business. Ultimately, you want to direct people to the link in your bio, use the swipe up link in your stories, or use your IGTV video descriptions to drive click-throughs to your lead capture on your website. What do you think? Are you surprised about how you can use Instagram for lead generation? Or are you already using some of these tactics for your business? Please share your thoughts or tips in the comments below. Discover three tools that increase your Instagram bio links. Find a step-by-step plan to drive traffic to your opt-in form using Instagram Stories. Learn how to combine blog posts into Instagram albums.